Open doors are mostly greeted with excitement, appreciation, thankfulness, appreciation or even with amazement, surprise and amusement. Depending on whether you have been trusting God to open a door of opportunity for you, or whether an open door has taken you by surprise, open doors always relate something new and exciting to us. Maybe you are trusting God for an open door today. It might be in your ministry, business, family or personal life. Regardless of the area or place or position you find yourself in, when you trust Him for this open door, keep His Word. Sometimes open doors become confusing when they are accompanied by opposition. You might be in a place where you have pursued an open door and are suddenly faced with major opposition, and now doubt whether it was from God or not. Take encouragement from Paul. 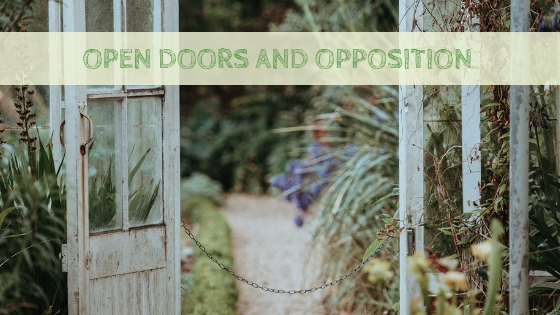 Sometimes open doors for effective work include a dimension of opposition. Remember, when you are engaged in God’s work you become a target of our enemy’s assaults. Stand strong in God today! Be strong in the Lord! Dear Father, I ask You to open many wonderful doors of opportunity for me and my family. Please give me the encouragement to faithfully pursue Your open doors, even when opposition arises. Please give me discernment about the open doors ahead! Amen.